Perhaps because it’s more out of the way, smaller, and slightly less spectacular than the Mercato Centrale, the Mercato di Sant’Ambrogio is frequented mostly by genuine Florentines and their wannabe compatriots. However, since it’s only a 15-20 minute walk from the Duomo, it can’t really be considered off-the-beaten track, and certainly such a convenient yet relatively uncrowded market deserves a gastronomic visit. I am especially fond of the place because I shopped there daily while living in the neighborhood for several months. I assure you that if you do happen to have a kitchen at your disposal the hardest part will be deciding what to cook. 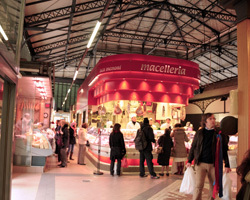 (and if you don’t have a kitchen but want a hot meal, try the Trattoria da Rocco inside the market). The market is arranged simply: produce outside under an awning, everything else inside. For fruits and vegetables, it’s best to show up before noon as many vendors sell out and then pack up just after noon. Eat whatever is in season, which is usually pretty obvious by the massive quantities of it on every table. One of my favorite local vegetables is cavolo nero, a type of mild dark green cabbage, which I’m told is impossible to find even as nearby as Bologna. A few other recommendations are the assorted filled pastas, with options like ricotta and orange ravioli, and the sliced meats and cheeses (be sure to read Andrea’s take on these options) which, with a loaf of bread and some fruit, make an excellent picnic lunch. If these suggestions are not adventurous enough for you there is a tripe cart (menu options: tripe, tripe sandwich, beer) just around the corner next to the church of Sant’Ambrogio (Chiesa di Sant’Ambrogio). 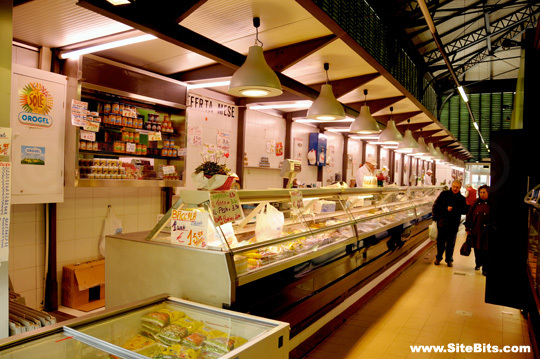 What you will not find at the market is a lot of seafood or ethnic ingredients, or souvenir items. Open 6 days a week, rain or shine. Busiest on Saturdays.